Do you know how to become a professional sommelier? What’s the meaning of AIS? I’m continuously receiving emails about this matter “How to become a sommelier?”. So, I’ve decided to publish a few different articles about the main sommelier associations worldwide. It will a be a real journey: discovering the main characteristics of the associations, sharing a few anecdotes and also talking with some experts. We’ll start with AIS and we’ll finish with the Master Sommelier and Master of Wine. In this article, I’ll go into more detail about the AIS. AIS stands for Associazione Italiana Sommelier or Italian Sommelier Association. Why do we start with AIS? As you already know, I’m studying to become an AIS sommelier. I’ve just started the 3rd level (in the next lines I’ll explain to you how the course is structured) and in a few months I will go for the final exam. Keep calm Simo, don’t panic! Therefore, AIS is the sommelier association that I know best. The choice of wine events on offer for AIS members is amazing! I think that you have seen a lot of them on my Instagram Stories. AIS organizes wine tastings, for example about indigenous grapes or wines from a particular region. Otherwise, there are also meetings focusing on particular topics, such as Champagne or Burgundy, so you can get to know them better. Another opportunity that AIS gives you is the wine trips. If you become an AIS sommelier, you could take part in all these events! Now, let’s get into the details about AIS. Become an AIS sommelier? Let’s ask Fabio Gallo! I had the opportunity to get to know Fabio during some of the lessons on the AIS course and also during Vinexpo. 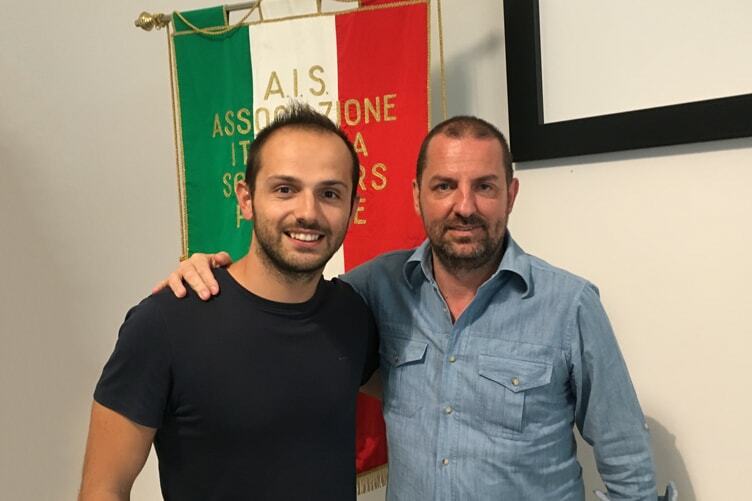 Fabio Gallo is the current president of AIS Piedmont. He’s also a professional in the wine trade. He has a gastronomy shop in the heart of Turin. The cellar of his shop is awesome. You can find several vintages of the best wines in the whole world there! Ok Simo, why exactly did you decide to ask Fabio about AIS? There are two main categories in the wine trade: wine lovers and professionals. Fabio represents both these categories. He has been a member of AIS since 1989. At the time he joined he was a wine lover and he already worked in the gastronomy shop with his parents. Furthermore, he has an incredible wine knowledge, especially about Piedmont and France. You should know that he is a big fan of Barolo and Champagne. Now that I explained to you who Fabio is, let’s ask him what do you need to do to become an AIS sommelier! Let’s start Fabio! In your opinion, what is a sommelier? I need to clarify something! I think that the term “sommelier” should not be necessarily associated with “professional”. Most of the wine experts in the world are not professional, but they are wine lovers. The most important wineries belong to private citizens. Anybody who works with the wine every day can be more knowledgeable than a professional. It’s all about passion! My friend Mauro Carosso (national teaching representative of AIS) is a great wine expert, but he’s not a professional. Therefore, I prefer to define a sommelier as a person with a great wine knowledge. A sommelier can recognize a wine in a blind tasting for example and could also guess the vintage! AIS gives you the fundamentals, but you and you alone can improve your wine knowledge with the tastings. Ok, then what’s the mission of AIS? If there are bad wines, the reason is that there are bad drinkers. It’s absolutely true! If we increase the quality of the drinkers i.e. the appreciation they have for the wine, then we can increase the quality of the wines. Another important point of our mission is to try to increase the consumption of wine because it has dropped down dramatically in recent years. In 1929 there was an average yearly consumption per person of 139 L in Piedmont; today it’s only 30 L. The countries that are mainly affected by this downturn are Italy, France and Spain. There are several reasons for this drop. The pace of life has changed, people eat their meals faster. The wine is more expensive. In the past, there was considerable consumption of wine by demijohn. It’s very important to assign the right perspective to the wine because it can bring people together with food. You don’t have to be obsessed with all the classifications, drinking only wines over 90 points. Wine is a very particular thing! If you take a wine, you drink it today and in one month, you can assign two different values to that wine. It depends on a lot of factors, your emotional state, location, time. There is not a wine that’s always the best, but only the best wine for a particular situation. If you are in Aosta Valley, there’s no guarantee that a Barolo is ideal with fonduta or motsetta. If you eat tortelloni in Parma, you drink a Lambrusco. Can you give me more details about AIS? When was it born? Is it big or small!? How is it organized? AIS is a non-profit cultural association. It grew considerably, supported also by several winemakers. AIS was the first sommelier association to obtain a juridical recognition. Financially, it always looked out only for membership fees as a way to support itself. Nowadays there are more than 35.000 members! The association consists of sections (or regions). Every section has its delegations, usually provincial. There is a regional president with the different provincial delegates. There is also a president, Antonello Maietta, in charge of the association. He works with the National Decision Committee. In a nutshell, the organization is federal, then the sections are independent but linked with the same regulation. And the course, how is it structured? I really liked the second level! 3rd level – wine and food pairing. At the end of the levels, there is a final exam that allows you to become an AIS sommelier. When I did the exam in 1989, there was an extra exam (very hard) to become a professional sommelier. Then the regulation changed! Before, the professional sommelier was a degree, now it’s a type of member. Another thing that has changed is the trend in members. In the past, there were a lot of professionals and not many wine lovers. Nowadays it’s the opposite, not many professionals and a lot of wine lovers! You’re the president of AIS Piedmont, one of the most beautiful wine regions, not only in Italy but in the world. What position does Piedmont occupy in Italy? AIS Piedmont is one of the regions with the most members. The others are Lombardy, Veneto and Tuscany. In Piedmont, we promote a lot of events. We are very active! We offer extra lessons, such as “Atelier du Vin” for Champagne, Bordeaux and Burgundy, in which we examine in depth the topic, or authentic wine experiences, such as “Friday in the Lounge”, a sitting room where you can taste highly valuable wines with some friends. Another unique event is “Ba&Ba“, Barolo & Barbaresco, that offers you a preview of the new vintage from the main Piedmontese wine producers. All this is “easier” now than in the past because we have our headquarters. Until 2002 we taught and organized events in hotels. The opening of the headquarters allows us to increase the number of members! Then, AIS Piedmont is very strong in Italy. What’s the importance of AIS in the world with the other sommelier associations? Does the AIS sommelier degree have value in the other countries? At the beginning, AIS was one of the founders of ASI (Association de la Sommellerie Internationale). 15 years ago it decided to create a new international association, the WSA (Worldwide Sommelier Association). This was a positive initiative in the beginning, but nothing happened after that. AIS is well-known in other countries. You can have all the degrees in the world, but if you are not able to work, you’re not going anywhere! We’ve just seen that AIS has a slightly marginal position, but the Italian wines are amongst the most excellent in the world. What’s your opinion about that? Yes! Italy produces unbelievable wines and they cannot be copied. The terroir is unique! France has always guided the market thanks to the international grapes, the weather and its soils. Its wines are exported all around the world (forever) because France took advantage from great commercial partners as English and Dutch, with their unique fleets and philosophies. Italy is blessed with more than 350 indigenous grapes. The Italian Nebbiolo is not equal to the American Nebbiolo. Italy has to continue to produce wines with indigenous grapes. A great mistake was the introduction of the international grapes, mainly in Tuscany. If we take Sassicaia, it can handle the comparison with a Bordeaux wine. But if we take a Supertuscan around 40€, it loses against a Chilean wine that costs 10$. In fact, now there are several Tuscan winemakers that are returned to use Sangiovese. The cost for producing Italian wines are much higher! When you try to sell Italian wine, you should sell first of all the Italian food and then the wine. That’s a powerful mix! And the other countries!? What are their movements? A very determined country is New Zealand, its wines are so interesting. Close to New Zealand, there is Australia. It’s a power, but around the 2000 it wanted to become the most important wine producer. It doubled the area of the vineyards and a few years later some wineries closed down. The country with the longer history is South Africa, but very limited by apartheid. About the USA, I think that there is not much to say. It’s a giant! In my opinion, the most terrific country is Spain. It produces cheap wines and they’re very good. I would like to change the focus on an important matter: the new seasons. What’s your opinion about this climatic change? Is it so worrisome? At the moment, the quietest winemakers are that stay at high latitudes. The increased heat increases the alcohol in the wine. This year, Barbera wines have reached 16% of alcohol volume. The experts are studying how to solve the situation. Some producers are trying to use new grapes. It’s very difficult and unfortunately, I don’t have a solution. This is a big problem, but I think that there is another problem in the wine trade: the trend for organic, biodynamic and natural wines. There are several wines with flaws and some producers justify their wines with the production philosophy. That’s completely wrong! I know that the production of a wine in these categories is very hard. But first of all, a wine should be good! If that is also organic, biodynamic or natural even better! There is a lot of misinformation about that and our assignment is very hard. Well Fabio, we’ve finished! What’s your message for an aspiring AIS sommelier? Taste a lot of wines! If you want to become a great professional, you need a lot of passion, as I already said previously. You start studying the technique and you taste every day. It’s the best workout! Another important thing to know is that wine is expensive. But you can find also great wines that are not so famous and come at a lower price. Be careful not to cheat! Taste pleasant wines and remember that the good wine is in the bottle that finishes early, beyond the 90 points. We have reached the end of the interview. One year ago I joined the AIS and I’m very happy about this. The teaching is very efficient and the wine events are many, as I told you previously. I can confirm that it’s the right start if you want to become a “sommelier” living in Italy. Fabio and me are waiting for your comments and your (potential) questions.